Trump says that his plan is a common sense compromise that both parties should enthusiastically support. No, this is total folly. 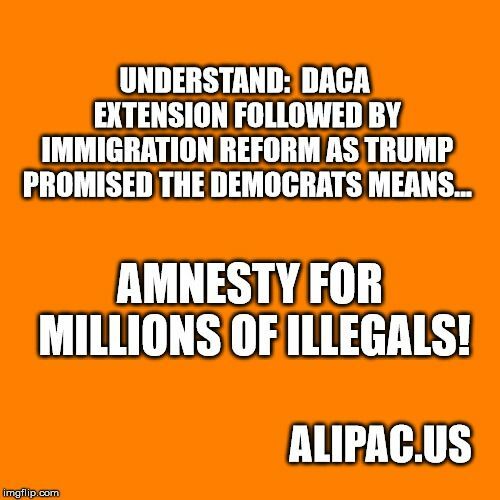 No DACA. No Amnesty of any kind. This President needs to end the government shutdown. It's gone on way too long, the government should have been restarted on the Sunday before Christmas. What is going on is absolutely ridiculous, a total loser deal, a suicide mission going nowhere for nothing. You want a wall? Next time vote Republican and take care not to discourage others from doing so. Otherwise, take your lumps or find another way to fund it. like what the President wanted to do to begin with which is have the military build it with DOD funds. I was very disappointed in his "major announcement". I thought and hoped he had come to his senses, was ending the shutdown and pledging to find other ways to fund some wall construction. That's what he should have done, in my opinion. It's just going from Dumb to Dumber, which is the way Dumb goes. So hey there, House Republicans, where are you? You told the President, you "had his back". With what? Pea shooters? Spit balls? You need votes, and you didn't have them and you can't get them. Therefore, you could never have his back on this. Big mistake, in my opinion, and nothing but a giant amnesty trap. Last edited by Judy; 01-20-2019 at 07:22 AM.